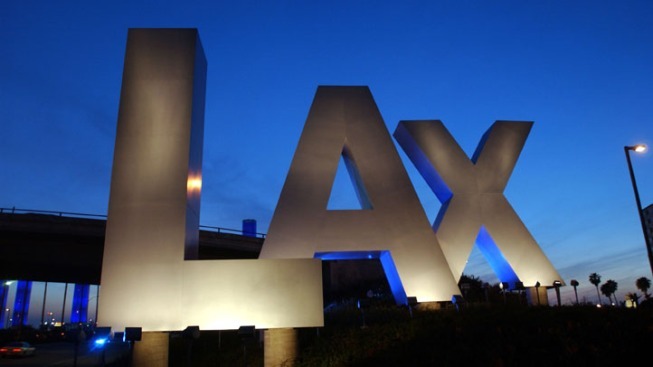 Two unusual incidents at the Los Angeles International Airport on Friday night ended with a small evacuation and one man in custody, one week after a lone gunman opened fire inside the airport. The first situation about 8 p.m. began at the TACA Airlines ticket counter when a ticket agent asked a passenger if he had anything in his luggage they should know about, LAX Police Sgt. Karla Ortiz said. The man responded by saying he had a dangerous item inside, police said. The ticket agent then called police and prompted a small evacuation of only the immediate ticketing area. The passenger said he was "only joking around" and was detained by police. The second incident was just before 9 p.m. when a limousine driver in front of Terminal 3 reported that a man had a weapon, LAX police said. The driver called airport police, who took the traveler into custody and found an unloaded handgun in his luggage. Police said the man, in his late 20s, would be arrested for brandishing a weapon. A Los Angeles Police Department bomb squad was called to search the man's belongings after officials found an empty gun case. The search did not prompt any evacuations. The incidents come in the wake of a shooting by a lone gunman who violently descended upon LAX Nov. 1, killing a TSA officer and hurting four others.